In many ways, this book reads like “The Guinness Book of World Records,” delivering factual tidbits so weird and so delightfully jarring that they’re almost unseemly. On November 2, 2007, we learn, a hailstorm walloped Bogota, Colombia, with 59 inches of ice and freezing water. In Yakutsk, Siberia, women in reindeer coats often wait outside for the bus when the temperature is -49 Fahrenheit. There’s a deeper story, though, in the lavishly illustrated encyclopedia: the earth is a lovely place, offering up more beauty and natural surprises than a layperson could possibly fathom. Who knew about “ball lightning,” which manifests as a ball of light that rolls on the ground and climbs trees? Or “sastrugi,” which are irregular wind-carved furrows and ridges in snow? 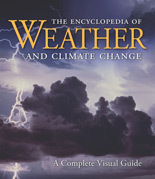 Fry and her coauthors maintain a tone of pleasantly restrained wonder, and they have organized their book quite logically, into six sections that start with the basics (“What is weather?”), then look at nature’s furies (thunderstorms, tornadoes, hurricanes) and the origins of climate science, before assailing us with the inevitable dark punch line: all the splendors you’ve seen heretofore—such as the sastrugi-rippled snows of Kilimanjaro—are in peril. To quote: “The marked increase in atmospheric carbon dioxide has no precedent in approximately the last 1 million years,” and the change “may rival or even exceed the meteor impact K-T extinction event, which brought the age of the dinosaurs to the end... In the aftermath of the 2006 East African drought, one Kenyan farmer’s herd plummeted from 85 cows to five.” The pictures sound the same disquieting note. Here, for instance, is an emaciated Ethiopian infant, his ribs bulging thanks to a drought and a famine. In conclusion, the encyclopedia provides a glimpse into humankind’s brave and varied fight against climate change. 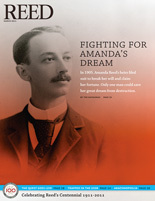 In 15 hopeful pages, we learn about recycling and reforestation and the virtues of Portland’s MAX train. Encouraging stuff, certainly, but it’s a detour from all the science before it. And, it is not really necessary. The science in this book, so clearly enunciated and so lyrically terse, sounds its own haunting call to action.